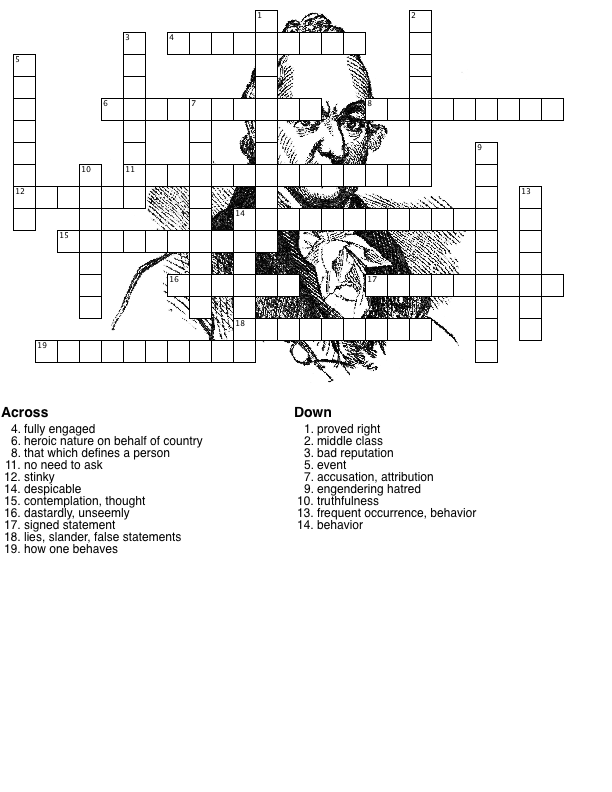 Crossword: Benjamin Tallmadge Refuses to Increase Pensions | What Would The Founders Think? John Paulding, Isaac Van Wart, and David Williams were the men were responsible for the capture of John Anderson, aka Major Andre. 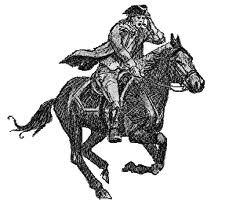 Major Andre was a spy carrying information between Benedict Arnold and the British. Because of his capture, Arnold’s plot to betray West Point was foiled and Arnold himself was very nearly captured. With George Washington’s personal recommendation, the United States Congress awarded Paulding, Williams, and Van Wart the first military decoration of the United States, the silver medal known as the Fidelity Medallion. Each of the three also received federal pensions of $200 a year, and prestigious farms awarded by New York State. But they had their detractors as well. One of these was Colonel Benjamin Tallmadge, the guy Washington selected as his chief intelligence officer. After the Revolution and ratification of the Constitution he served in the House of Representatives. It was here he voiced his disdain for the character of these men and persuaded Congress not to grant them a requested pension increase in 1817. He publicly challenged their credibility and motivations. The Niles Weekly Register ran an article which took exception to his stand on this. This week’s crossword is taken from that article. Before we get to the crossword, a little background might help to provide context. As it turns out, Colonel Tallmadge was a Federalist and served as part of a minority for his entire tenure in the House of Representatives. The Federalists tended to represent the aristocratic “republicans” while Jefferson’s Republican party appealed more to the common man – the lower classes. The Federalists glorified the idealistic patterns that “gentlemen” served with honor, duty, and self-sacrifice, producing selfless heroes like Washington. The Republicans grew to represent people more akin to Sam Adams. They sought to glorify the citizen patriot, of which Paulding, Van Wart, and Williams were prototypical. Having lost their majority, and many of their champions, with Washington and Hamilton dead, John Adams out of office and unpopular, the Federalists strove in vain to define themselves. One can only assume that Tallmadge’s attack on these three icons (at the time) of American history was motivated by some political maneuver as hinted to in the article from the Niles Register. Or was this perhaps due to a vague remnant of the sympathy he felt for Major Andre. 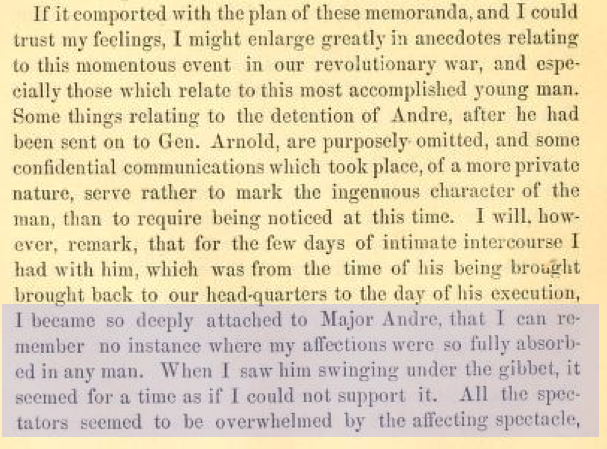 His memoirs and other accounts of the capture and subsequent execution of Major Andre, indicate that Andre made a strongly positive impression on all who came into contact with him. Interestingly enough, while he hints at having left some things out about the period of Andre’s captivity, he doesn’t cast any aspersions on the three heroes in his memoirs, barely mentioning them. He was, apparently the ideal, for a well-bred gentleman officer of class. 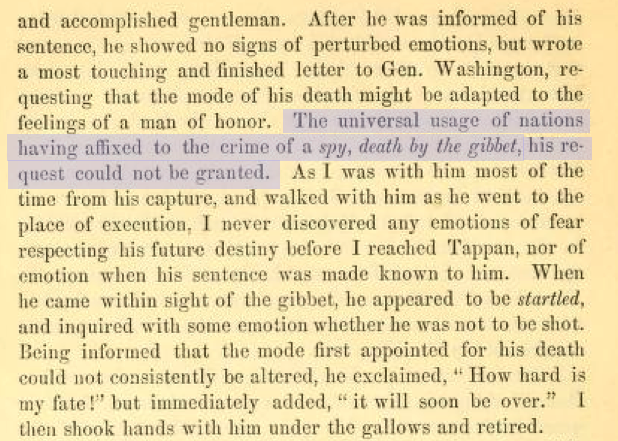 Nonetheless, despite their regard for the spy, he was executed summarily in the fashion reserved for those caught pursuing such an “ungentlemanly” occupation – the gibbet. In the course of researching this, we’ve stumbled on some interesting resources, including the aforementioned memoirs of Tallmadge, and The Journal of The Early Republic some of which is available on line.